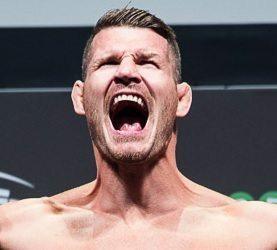 Michael Bisping was born on a military base in Cyprus in 1979. 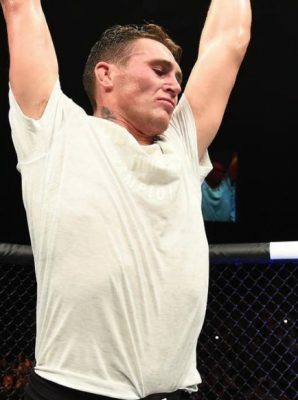 He is the first UFC champion from the UK. He is the reigning defending UFC Middleweight Champion of the World. He has won titles in kickboxing before competing in MMA. When he was 15 years old he competed in the first ever amateur No Holds Barred fight in England. NHB fights were the predecessor of modern MMA. Michael Bisping made his MMA debut in 2004 and finished his opponent by submission after 38 seconds. In his third pro fight he fought Mark Epstein for the title at Light heavyweight in Cage Rage. Later the same year he defeated Epstein once again for his first title defense. He also won the Cage Warriors belt and defended it three times before capturing his final belt before departing to the UFC, the FX3 belt. Michael Bisping was a part of The Ultimate Fighter season three. He defeated Kristian Rothaermel and Ross Pointon to advance to the finale. The finale was also Bisping’s official UFC debut against fellow finalist Josh Haynes. The two met on The Ulimate Fighter 3 Finale where Bisping TKO’d his opponent in the second round. He won three more fights in the UFC before he lost to Rashad Evans. After the loss to Evans he moved down to the middleweight division. He made his middleweight debut against Charles McCarthy and won via TKO. He won two straight fights and got a coaching gig for TUF opposite Dan Henderson. The two met at the finale and Henderson brutally KO’d Bisping and made the KO the symbol of his brand. Michael Bisping had 16 more fights after the loss to Henderson. His five losse came to Wanderlei Silva, Luke Rockhold, Vitor Belfort, Chael Sonnen and Tim Kennedy. He beat Anderson Silva, Yoshihiro Akiyama and Cung Le. In his 17th fight he filled in for a injured Chris Weidman at UFC 199 in California. Bisping knocked the champion Rockhold out after 3 and a half minutes and became the new champion. He defended his belt against Dan Henderson by unanimous decision at UFC 204: Bisping vs. Henderson in October of 2016. Michael Bisping faces Georges “Rush” St-Pierre at UFC 217 – Bisping vs. St. Pierre on November 4th at Madison Square Garden.